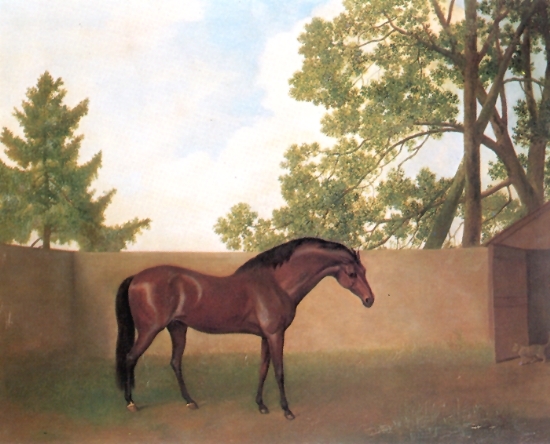 Godolphin Arabian - Painting by George Stubbs in 1792. The Godolphin Arabian (c. 1724 - 1754), also known as the Godolphin Barb, was an Arabian horse who was one of three stallions that were the founders of the modern Thoroughbred horse racing bloodstock (the other two are the Darley Arabian and the Byerley Turk). He was given his name for his best-known owner, Francis Godolphin, 2nd Earl of Godolphin. The veterinary surgeon Osmer, as quoted by Prior, described him in the following manner: "There never was a horse (at least, that I have seen) so well entitled to get racers as the Godolphin Arabian; for, whoever has seen this horse must remember that his shoulders were deeper, and lay farther into his back, than those of any horse ever yet seen. Behind the shoulders, there was but a very small space ere the muscles of his loins rose exceedingly high, broad, and expanded, which were inserted into his hindquarters with greater strength and power than in any horse I believe ever yet seen of his dimensions, viz fifteen hands high." Controversy exists over the ancestry of the Godolphin Arabian; some writers referred to him as a Barb, because of his believed country of origin, Tunisia, on the Barbary Coast, but portraits, showing a horse with a high-carried tail and dished profile, features that differentiate Arabians from Barbs, lead experts to believe he was more likely an Arabian. The confusion is understandable, but while the breeds have some characteristics in common and are distantly related, their phenotypes are quite distinct. There was also an argument raised that he was actually a Turkoman horse, merely called an Arabian in order to raise the stud fee. However, it is most widely believed that he was an Arabian or had primarily Arabian lineage. The Earl of Godolphin referred to the horse as an Arabian, and he was described as such by the painter George Stubbs. Lord Godolphin later bought a second stallion in 1750. This one he clearly called a "barb." Both were of a similar bay color but the Barb had a star. Godolphin later bought a grey Barb which has also caused some confusion over the years. The horse was imported from France by Edward Coke and sent to his stud at Longford Hall, Derbyshire where he remained until the death of his owner in 1733. He was bequeathed to Roger Williams who inherited Coke's stallions. He was bought by the 2nd Earl of Godolphin, and placed at his stud at Babraham, Cambridgeshire until his death on Christmas Day 1753. 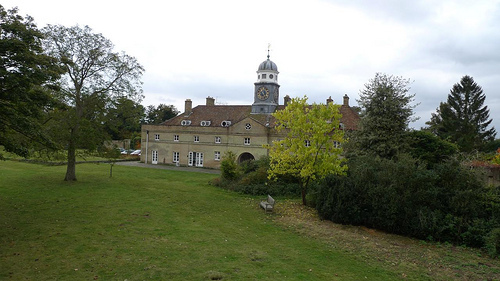 The Godolphin Arabian was buried within the stable block at Wandlebury in 1753 at the age of 29. Originally, this small stallion was considered inferior to the larger European horses of the time and not meant to be put to stud. This changed when Lady Roxana, a mare brought to the stud specifically to be bred to a stallion called Hobgoblin, rejected her intended mate, and so the Godolphin Arabian was allowed to cover her instead. The result of this mating was Lath, the first of his offspring, who went on to win the Queen's Plate nine times out of nine at the Newmarket races. The second colt from this pair was Cade, and the third was Regulus. All three were the same gold-touched bay as their sire, with the same small build and high crested conformation. All were exceptionally fast on the track, and went on to sire many foals themselves. This was the start of the Godolphin Arabian's prowess as a racing stud, and he spent the rest of his days as the Earl of Godolphin's prize stallion, bred to England's finest mares. The major Thoroughbred sire Eclipse traces in his sire line to the Darley Arabian, but his dam was a daughter of Regulus and thus also traces to the Godolphin Arabian. This pattern continues to be seen today, with the Godolphin Arabian more heavily represented in dam lines and in the "middle" of pedigrees as opposed to direct sire lines. The American connection began with the filly Selima (born in 1745 out of Shireborn). She was purchased by Benjamin Tasker, Jr. of the Province of Maryland in Colonial America, carried to the new world, and raced between 1750 and 1753. She won the biggest prize of the era, 2,500 pistoles at Gloucester, Virginia which marked "the beginning of the remarkable racing contests between the rival colonies of Maryland and Virginia." After this, she became a successful broodmare at the Belair Stud in Collington, Maryland. Although today the majority of Thoroughbred horses' sire lines trace to the Darley Arabian, many famous American horses of the past trace their sire line back to the Godolphin Arabian. These include Seabiscuit, Man o' War, War Admiral, and Silky Sullivan. Today, dual Breeders' Cup Classic winner Tiznow represents his line. Funny Cide's sire line ends at the Darley Arabian, but he has the Godolphin Arabian elsewhere in his pedigree, as do many other modern Thoroughbreds. The Godolphin Arabian's grave in the stable block of Wandlebury House can be visited. Among the many famous horses he sired were Lath, Cade (full brother to Lath), Blank and Regulus. A somewhat romanticized biography of the Godolphin Arabian is told in King of the Wind, a children's novel by Marguerite Henry (better known for her Misty of Chincoteague stories). In the novel, the Godolphin Arabian was foaled in Morocco and was called Sham. He came to Europe as a diplomatic gift to King Louis XV of France, but was given to the cook as a cart horse and was soon sold to a woodcarter where he was poorly treated; he was then subsequently purchased in Paris by the Quaker Edward Coke of Holkham Hall, son of the Earl of Leicester, then sold to Francis, Earl of Godolphin, who maintained a stud in Suffolk, near the racing town of Newmarket. Earl of Godolphin was a title in the Peerage of England. It was created in 1706 for Sidney Godolphin, 1st Baron Godolphin, the Lord High Treasurer. He was created Viscount Rialton at the same time and had already in 1684 been created Baron Godolphin, of Rialton. These titles were also in the Peerage of England. He was succeeded by his only child, Francis, the second Earl. He married Henrietta, 2nd Duchess of Marlborough. Their only son, William Godolphin, Marquess of Blandford, was childless and predeceased both his parents. 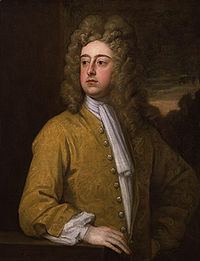 In 1735 Lord Godolphin was created Baron Godolphin, of Helston in the County of Cornwall, in the Peerage of Great Britain, with remainder, in default of male issue of his own, to the male issue of his deceased uncle Henry Godolphin, Dean of St Paul's. On the second Earl's death in 1766 the earldom, viscountcy and barony of 1684 became extinct. However, he was succeeded in the barony of 1735 according to the special remainder by his cousin, the second Baron. He had previously represented Helston in the House of Commons. On his death in 1785 this title became extinct as well. Lady Mary Godolphin, daughter of the second Earl, married Thomas Osborne, 4th Duke of Leeds. In 1832 the Godolphin title was revived when their grandson Lord Francis Godolphin Osborne was created Baron Godolphin. The ancestral seat of the Godolphin family was Godolphin House near Helston in Cornwall. The family took a close interest in mining and a number of mines were founded on their land. At Wheal Vor they experimented with several new inventions (for instance, the Newcomen engine in 1715) to improve the working of their mines.